New Orleans is a singular destination in the United States; there's no other city quite like The Big Easy. And it's on just about everyone's bucket list. You can spend a lot of money on a visit there if you stay in a very upscale hotel, eat repeatedly at pricey restaurants, and take in expensive nightlife. But you can have lots of memorable fun in New Orleans and get the flavor of this exotic city even if you're on a budget. Spring and fall are great choices for a New Orleans visit, although September and October can bring the threat of hurricanes and tropical storms. Summers tend to be uncomfortably hot and muggy. Dress accordingly if you'll be spending much of your summertime visit outside. Most visitors would find winters rather mild, and it's a relatively good time to visit since you might also find better deals during this season, but you'll need some cold-weather gear for some days from January through March. Busy (and expensive) times of year are Mardi Gras (Fat Tuesday; dates vary), spring break, Jazz Fest (late April to early May), summer, and the days before the Sugar Bowl football game on New Year's Day each year. If you want to avoid inflated hotel room rates, avoid these high tourist times. A po'boy shrimp sandwich, a bowl of seafood gumbo, a muffuletta sub, red beans and rice, or a breakfast beignet are all part of the eating experience, and all these iconic New Orleans eats are relatively inexpensive. As a rule, restaurants in touristy areas offer these delicacies at higher prices than you'll find elsewhere, but sometimes you're paying for quality ingredients and convenience. World-famous restaurants such as Brennan's, Commander's Palace, Arnaud's, and Galatoire's are big splurges for budget travelers. Try just one for the experience and the rest of the time eat less expensively at other places that are memorable and cheap. You can find local specialties at a price you want to pay by consulting the New Orleans Dining Guide from the New Orleans Times-Picayune. You can find an affordable New Orleans hotel if you shop for deals. Most searches focus on sections of the city. The popular Central Business District (CBD) and French Quarter hotels fill up fast. But remember that even if you find a great hotel room rate, parking is costly, and it adds up if you are going to be in the city for several days. City parking garages can save money on expensive valet services, but they are not as convenient as a hotel garage. Metairie and the area near Louis Armstrong New Orleans International Airport (MSY) offer budget lodgings, but they are not as convenient to the main tourist attractions and restaurants in central New Orleans. Expect to pay top rates during Mardi Gras, when rooms often come with a five-night minimum stay. Some veterans of the celebration advise getting room reservations eight months in advance. Riding the streetcars in central New Orleans is a real bargain and a great travel experience. Check in with the Regional Transit Authority for updates and information on the system. Cabs are a good idea after dark for safety reasons. 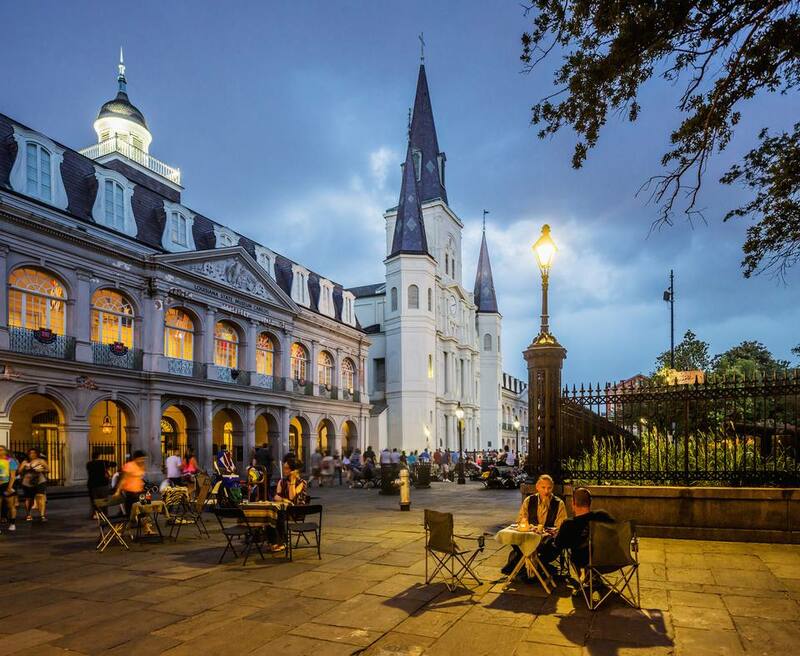 The French Quarter ranks among America's must-see attractions. You can go into almost any bar in the French Quarter or on Frenchmen Street and hear great music every night for the cost of a couple of drinks and maybe a small cover charge, and this is the heart and soul of New Orleans. Other areas that deserve attention and cost little or nothing to see are the Garden District between St. Charles Avenue and Magazine Street, which features antebellum homes and lush landscaping, and the Warehouse District just outside downtown, which is home to fine restaurants, museums, and the Riverwalk, a half-mile stretch of more than 200 shops. For a great view of New Orleans, take a ferry ride: The ferry at the base of Canal Street to Algiers Point is free for pedestrians and offers great views of the skyline and the harbor. Small splurge: a beignet breakfast: Cafe du Monde is across Decatur Street from Jackson Square and a favorite of tourists seeking a Creole breakfast of beignets (pronounced ben-YEA) and cafe au lait. This can be had for less than $5, but the wait is often long. Beignets are deep-fried pastries sprinkled with powdered sugar and can be had at all hours of the day in a variety of restaurants. This is an iconic New Orleans experience, not to be missed. A word about crime: As in any large city, there are areas that should be avoided, especially after dark. Police presence is strong in heavily touristed areas such as the French Quarter, but be careful not to wander alone into unfamiliar areas. Don't display expensive jewelry or wads of cash, and don't hesitate to spend a few extra dollars on a cab, especially at night. Mardi Gras: Park and then ride to the parades because parking space is limited, and drivers of towed cars pay a hefty fine; choice viewing spots often require arrival four hours before start time. Time is money; many places require cash payments. Consider wearing a money belt. Attractions beyond New Orleans: Swamp tours south of New Orleans are popular for day trips. Shop the variety of prices and services carefully. If you have a car, it's fun to visit Cajun Country (Lafayette is the main city, about 140 miles west of New Orleans). Westbound routes Louisiana Highway 44, U.S. 61 or Interstate 10 will take you past a series of plantations. This tour is a must for history buffs or antique lovers. Baton Rouge (80 miles west) boasts top museums, the tallest capitol building in the U.S., and Louisiana State University. Drive to New Orleans via the Natchez Trace Parkway: If you're driving to New Orleans from Memphis, Nashville, or Birmingham, consider connecting with the Natchez Trace Parkway. It's a slow but pleasant drive that connects you with Natchez, Mississippi, a beautiful and historic city about two hours north of Baton Rouge. Coming to the Superdome as a Visiting Fan? Here Are Some Tips!